2-image display for Yamajiart Exhibition 2007. Western science seeks to understand how the world works through a ‘scientific method’, with its systematic, epistemological processes.10 This approach contrasts with traditional knowledge systems which western science perceive of as being contextual, contingent, and less credible.11 Communication systems are similarly divergent, with Western models of science focusing on peer review, written and visual tools.12 Aboriginal knowledge transmission tends towards cultural encodings in oral and visual traditions, passed to successive generations through daily social, cultural and ritual events.13 Visual productions and storytelling are used to create analogies that explain relationships between people and the natural world; they are fundamental to social and ceremonial activity.14 The images at https://www.skatelescope.org/australia/, created for a cross-cultural scientific programme exploring sharing of indigenous astronomical knowledge, represent and communicate indigenous science. The aim of both western and indigenous science is to make sense of the world. Both approaches can explain seasonal variations and landscape features, dictated by different scientific ‘subcultures’.19 Western sciences use atmospheric and radar technology to map storm systems or indicate weather events, and has a short history of experience to draw on. Aboriginal cultures assess the twinkling (scintillation) of the stars to determine levels of turbulence and moisture in the atmosphere, with demarcations applied to determine specific weather events and seasonal changes.20 Dreaming pictures and stories provide narratives of how to read and live in the ensuing conditions. 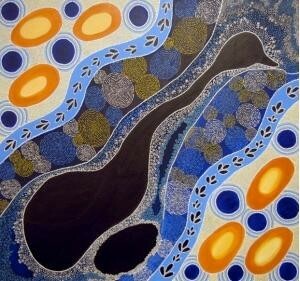 Aboriginal Dreaming stories have been ratified by examining alignments between oral descriptions and identifiable geological or biological events, such as sea level changes, and meteor strikes. The communicative efficiency of this ‘long view’ transmission culture appears substantial.24,25,26 Sophisticated understandings of lunar/tidal processes and the earth as a finite object rather than a flat infinity predates ‘western’ science by thousands of years.27 This capacity for communicating observations and experience enabled indigenous communities to survive in challenging environments for 40,000years. Science is frequently characterised as objective, and art as subjective, but Daston and Galison28 note that ‘images are inextricable from the daily practices of science, knowledge representation, and dissemination’29 such that the distinctions between objectivity and subjectivity, science and art are blurred.30 The cultural history of Aboriginal art shows that this is relevant to indigenous science too. The observational and visual processes of Aboriginal astronomers, facilitating understanding of indigenous knowledge as science, correlate strongly with Western scientific visualisation activities. Norris, Ray P. and Duane W. Hamacher (2009) The Astronomy of Aboriginal Australia. Valls-Gabaud D., & A. Boksenberg, eds. The Role of Astronomy in Society and Culture Proceedings IAU Symposium. Fuller, R.S., Anderson, M.G., Norris, R.P., Trudgett, M. (2014) The Emu Sky Knowledge of the Kamilaroi and Euahlayi Peoples. Journal of Astronomical History and Heritage 17(2): 171-179. Norris Ray P. (2016) Dawes Review 5: Australian Aboriginal Astronomy and Navigation. Astronomical Society of Australia. Bhathal, Ragbir & Terry Mason (2011) Aboriginal astronomical sites, landscapes and paintings Astronomy and Geophysics 52 (4): 4.12-4.16. Myers, Fred (2009) ‘Representing Culture: The Production of Discourse(s) for Aboriginal Acrylic Paintings’, In Morphy, Howard, Morgan Perkins eds. The Anthropology of Art: A Reader John Wiley & Sons. 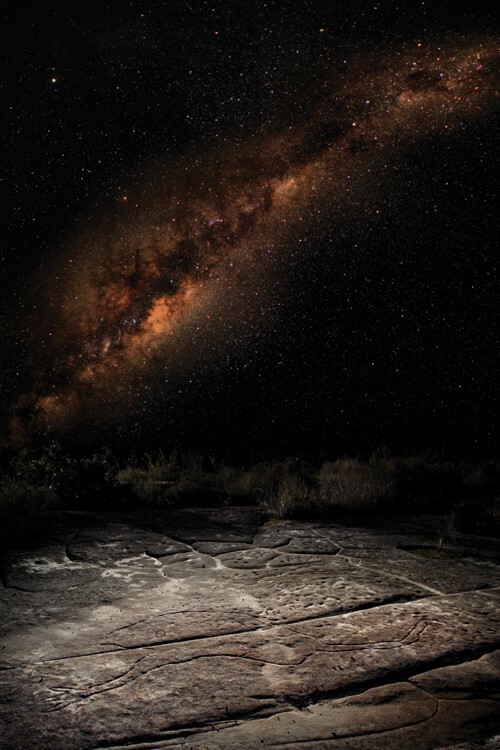 Yorro Yorro, Mowaljarlai (1993), Ngarinyin tribal Elder from Bhathal, Ragbir & Terry Mason (2011) Aboriginal astronomical sites, landscapes and paintings (pp 414). Burri Regula Valérie & Joseph Dumit (2008) ‘Social studies of scientific imaging and visualization’, Ch 13 in Ed Hackett et al., The Handbook of Science and Technology Studies, MIT Press: p300. Littlejohn, Stephen W., Karen A. Foss (2010) Theories of Human Communication. Sonia, Meg Parsons, Knut Olawsky, Frances Kofod (2013) The role of culture and traditional knowledge in climate change adaptation: Insights from East Kimberley, Australia. Global Environmental Change 23 (3): 623–632. Green, D., G. Raygorodetsky (2010) Indigenous knowledge of a changing climate. Climatic Change 100 (2): 239-242. Walsh F. J., P. V. Dobson, and J. C. Douglas. 2013. Anpernirrentye: a framework for enhanced application of indigenous ecological knowledge in natural resource management. Ecology and Society 18(3): 18. Haynes, Raymond Roslynn D. Haynes, David Malin, Richard McGee (2010). Explorers of the Southern Sky: A History of Australian Astronomy Cambridge UP. Harding, Sandra (20150 Do Micronesian Navigators Practice Science? In Harding, Sandra, Objectivity and Diversity, University of Chicago Press. Aikenhead Glen S. (1997) Toward a First Nations cross-cultural science and Technology Curriculum Science Education 81: 217-238. Williams, Carl. 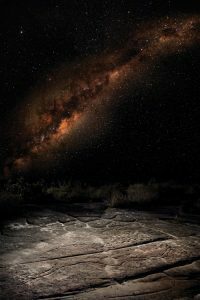 Aboriginal astronomy and the natural world [online]. Australasian Science 36 (8): 16-19. Reid, N, Patrick Nunn, (2015) Ancient Aboriginal stories preserve history of a rise in sea level The Conversation https://theconversation.com/ancient-aboriginal-stories-preserve-history-of-a-rise-in-sea-level-36010 (accessed 12/08/16). Hamacher, Duane W., and Ray P. Norris. 2009. ‘Australian Aboriginal Geomythology: Eyewitness Accounts of Cosmic Impacts?’ Archaeoastronomy 22 (1): 62–95. Nunn Patrick D. (2014) Lashed by sharks, pelted by demons, drowned for apostasy: the value of myths that explain geohazards in the Asia-Pacific region. Asian Geographer 31 (1): 159-82. Norris Ray P. (2016) Dawes Review 5: Australian Aboriginal Astronomy and Navigation. Daston Lorraine, Peter Galison (2010) MIT Cambridge MA.